False narratives and misinformation are polarizing communities around the country. What kinds of creative interventions can writers and others stage to address these divisions? 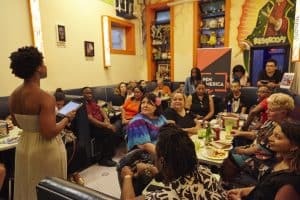 PEN America hosted a presentation and facilitated discussion around some of the ways New Orleans-area members of the literary and media communities can help guide the exchange of stories, information, and news in community—and how these exchanges intersect with specific local causes and concerns. We brainstormed and facilitated discussion around different possibilities and also discussed funding opportunities the organization has made available to support locally led projects and events. Some of the projects currently kicking off in New Orleans included media trainings, community narrative workshops, and outreach programs to meet the information needs of vulnerable communities. Our work is touching on issues like voter participation, civil rights and social justice efforts, news literacy, and more. We’re building a movement from stories and conversation in community. Writers, reporters, advocates, and civic leaders were invited to attend. **Please note: This was a free community event.